After all, maybe Andrew and Justin are onto something. Maybe I lost my edge. I mean – Since when have I become a Prius-driving, NPR-listening, vegetable-growing sensible professional adult? It’s time to reconnect with my fun, rebellious self. And nothing says I’m young and care-free and have high metabolism like chicken wings. This was one of the first recipes I learned to cook from my mother, as it was my all-time favorite. Chickens are pre-cooked with the aromatics first (and your home will smell so good at this point already), then pan fried until golden with garlic slices before quickly braised with soy sauce and rice wine. But what makes the dish is Chinese five-spice – As a matter of fact, this introduced me to the intoxicating spice blend, which is something, quite frankly, nobody should live without. And do NOT discard the soup that you cooked the wings with. They make incredibly flavorful base for authentic Chinese soup you can throw together at the same time. Clever, Mom. Clever. 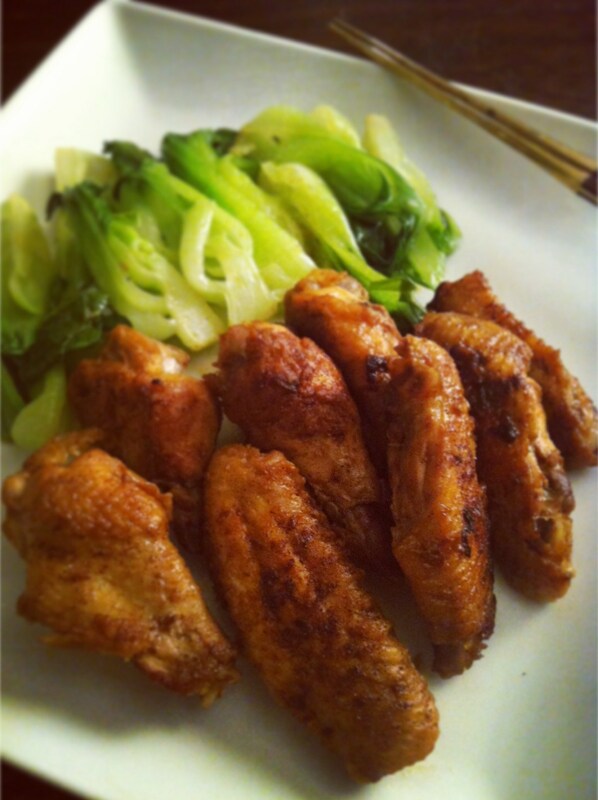 So this weekend I sat back on my couch in front of TV with these wings and enjoyed every finger-licking bite of them, while watching Jackson Galaxy turn another wild cat into a perfectly domesticated pet in a new episode of My Cat From Hell on Animal Planet. I don’t care what you say – The guy is AMAZING. But I did skip commercials this time. Put chicken wings, leek and ginger slices into a large pot. Add water until all the ingredients are submerged (About 6 cups) and bring to a boil. Reduce heat to simmer, and cook for about 20 minutes, uncovered. Watch the pot and skim fat that surfaces often – Otherwise the soup will not be clear. Remove the pot from the heat and cool it down a bit, then take out the wings. Discard leek and ginger, and set aside the stock for another use** (This time I made tomato egg drop soup – The recipe follows). Cut off the tip and discard. Then divide a wing into 2 sections by cutting between the joint. You can prepare the wings up to this point if you make them in advance. Keep them in refrigerator until future use. Heat sesame oil in a large skillet over high heat. Add garlic slices and fry until they are fragrant and start to brown, about 2 minutes. While the wings are frying, measure and mix soy sauce and Chinese rice wine. Add soy sauce mixture to the pan and cook under high heat, while vigorously shaking the pan or stirring often, until moisture is evaporated and the wings are well coated with the thickened sauce. Remove from heat and sprinkle as much Chinese five spices as you like. If this is first time, you might want to start with moderate amount, say 1 teaspoon. If you know you like it, go nuts. ** If you want to further skim fat from the soup, pour the stock in a container and put it into a refrigerator. A thin layer of fat gets solidified at the top once it is completely cooled so you can remove it easily. 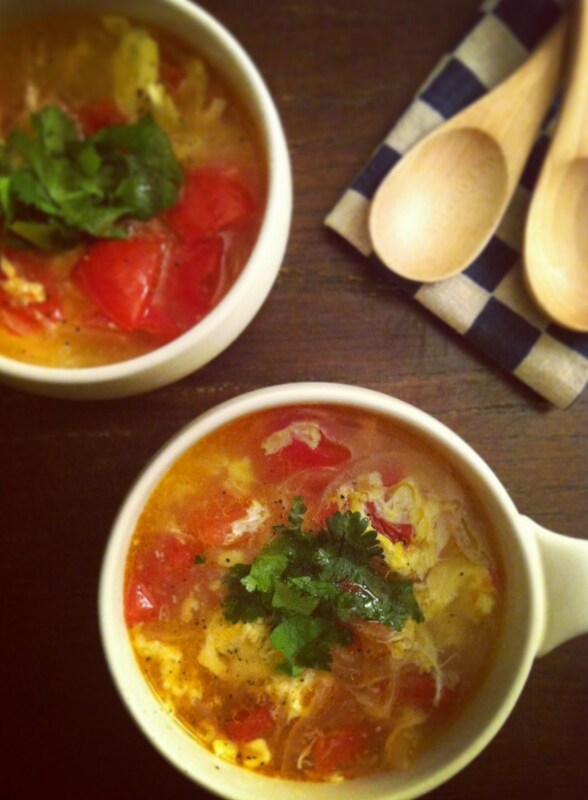 Here are a few tips to make a perfect egg drop soup if you haven’t cooked it before – Just follow these and your soup will be restaurant ready! (1) Thicken the soup with starch mixture (2) Add whisked egg in a small stream into boiling soup (3) Don’t stir once egg is added. Heat the oil and a medium pot and saute tomatoes and onion slices briefly until they start to soften, about 3 minutes. Add the soup stock and bring to a boil. Reduce the heat to lively simmer. Add salt and sake and cook until vegetables are soft, about 10 minutes. While the soup is cooking, whisk the egg in a bowl. I like using chopsticks to whisk the egg (especially it is useful when you make a egg drop soup – you will see why soon below). Turn up the heat and bring it to a rolling boil again. Mix the starch and water again (starch is probably at the bottom. I use my finger to blend the mixture right before I add to the soup), then add to the soup while stirring. Lower the heat to medium. Keep stirring until the soup thickens. Bring the heat up again to a gentle boil. Add the egg into the pot in a stream – I attach chopsticks to the side of the bowl while pouring, so egg will drip from chopsticks in order to make a small but steady stream. Do NOT stir once egg is added. Once egg gets fluffy and comes to surface, remove the pot from the heat. Add black pepper to taste, garnish with cilantro and serve immediately.